Discover the Hérault department by doing the via ferrata of the Thaurac. You will evolve on a path between rock and metal with passages in caves, using ziplines, climbing and ledges. A magical location to admire the Cévennes mountains and the canoes going down the Hérault river below you. 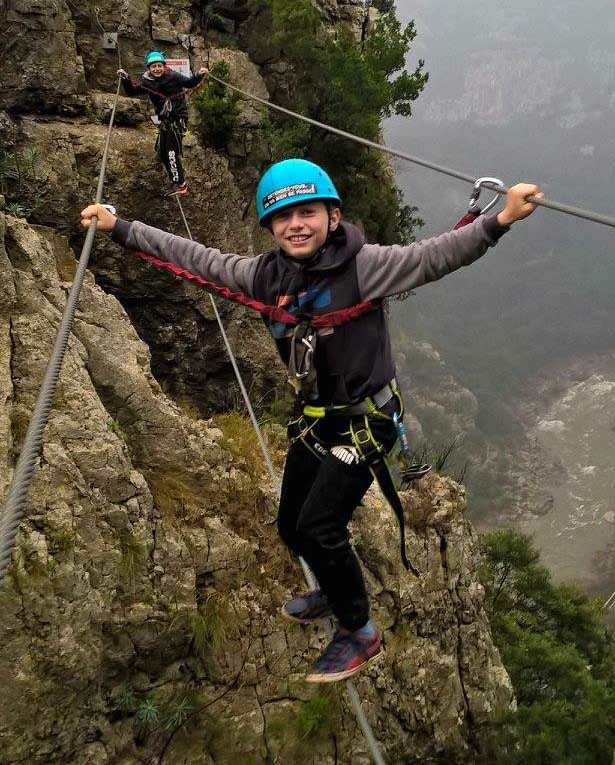 Located in Saint Bauzille de Putois near the grotte des demoiselles, the Via Ferrata of the Thaurac is one the most beautiful and varied of the Occitanie region. Between hiking and climbing, this gorgeous route will show you every technique that you can find in via ferratas with lots of features like caves, bridges, ledges and ziplines above the Hérault river. You will be able to see the Mont Aigoual and the Cévennes during the climb or if you decide to take a rest. If you want to discover what via ferrata is all about then this route is for you. It will allow you to progress with confidence whilst you have a great time with your close ones. Everyone can do the activity and the minimum age for the route is 8 years old. Guided by an instructor, this activity which lasts half a day will teach you how to abseil/rappel and you can even do a pendulum jump if you want to. The activity lasts 4 hours. The meeting location is at 9:00 in the morning or 15:00 in the afternoon in Saint Bauzille de Putois on the car park/lot P1 of the grotte des demoiselles, 35 minutes north of Montpellier and 10 minutes from Ganges. As soon as the group is complete, the via ferrata gear is handed out and safety instructions are given to you by a certified instructor. We then walk for 20 minutes to the start of the route and for 20 minutes on our way back at the end.